This decadent dessert is a legend at our parish's Paschal (Easter) feast - the serving bowl is often literally licked clean when everyone is done! It's super easy because it relies on box mixes and Cool Whip, but somehow the combination of the various ingredients results in a surprisingly tasty and even elegant completed dish. Prepare brownies as directed on the box. After you pull the pan out of the oven, poke some holes in the brownies with the end of a chopstick (or a similar item), and pour the coffee over the top of them (optional). Let cool. Gently fold half of the Cool Whip into the pudding so you get a mousse-like consistency. Now it's time to layer these ingredients into your serving bowl! A clear glass bowl is the most attractive, but anything will do. How you layer it depends on the shape of the bowl and if you are doubling (or tripling or quadrupling) the recipe. The basic order is: break up the brownies into large pieces and put a single layer in the bottom of the bowl. Top with the all the pudding, half of the cookie bits, then the rest of the brownies. End up with the remaining Cool Whip and sprinkle the top with the rest of the cookies. I usually quadruple this recipe for a crowd, and use a big bowl, and end up repeating layers more than listed above. You need a brownie mix that is over 20 oz. and requires a 9x13 pan. I like the taste of the Ghirardelli brownies mixes best, but they are more like 18 oz. and use a smaller pan. So, I just make a little extra! I'm not crazy about the nutritional quality of many of the ingredients - especially Cool Whip! My fantasy is to create a "real food" version of this by combining the recipes I have for homemade brownies, chocolate pudding, and real whipped cream, but I'm usually making a quadruple batch of this under time pressure and just haven't pulled it off yet. However, I do make a few choices that help - I use local raw milk, and when preparing the brownie mix I use melted coconut oil (refined) and local pastured eggs. O happy day! I thought you were gonna give info on how chocolate is slowly killing us. I didn't want to know and wasn't gonna click on the link as for me with chocolate, ignorance about some e-coli ladened cocoa beans would certainly be bliss. But, as a chocoholic, I couldn't control myself and now I'm glad I clicked! Yum and I always buy Ghirardelli brownie mix each time I go to Costco. 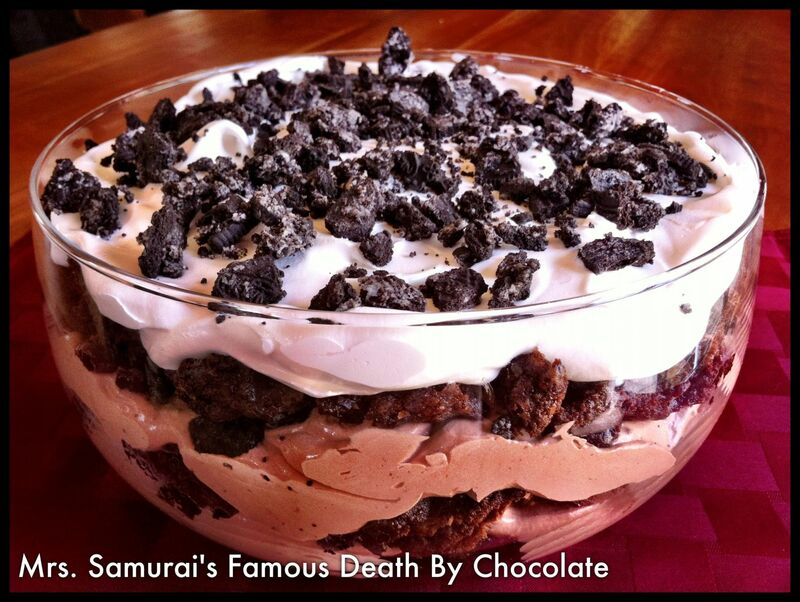 I make a version of this and use the chocolate cool whip!!!! Whoa !!!!!!!!!! Talk about a sugar rush CHOCOLATE high. Heaven for us chocoholics !!!!!!!!!!! Ghirardelli brownie mix iz the BEST !!!!!!!!!!! !